American manned combat spacecraft. Study 1973. 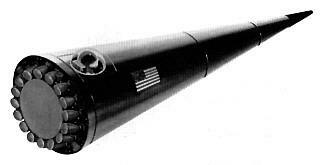 The space cruiser was a US Navy design for a single-place crewed space interceptor designed to destroy Soviet satellites used to track the location of US warships. Status: Study 1973. Gross mass: 4,500 kg (9,900 lb). Height: 8.08 m (26.50 ft). In the first half of the 1970's the US Navy began serious development work on a space cruiser - a single-place crewed space interceptor intended for "scientific and military applications". The Navy was specifically interested in knocking out Soviet satellites used to track the location of US warships. The space cruiser was to have been launched into orbit by a Poseidon missile from a ballistic missile submarine. This would allow clandestine launch, interception, inspection, and destruction of enemy satellites out of range of their tracking and launch warning systems. The mission was to be accomplished in one orbit, two maximum, before the Soviet tracking network would even know it had occurred. The space cruiser was 8.08 m long, had a gross mass of 4500 kg, and used the re-entry shape developed for the Poseidon MIRV warheads. 17 engines were mounted in the base - perhaps a plug nozzle design for maximum specific impulse in orbit with minimum engine length. Alternate launch platforms considered were land launch by MX Peacekeeper ICBM or air launch from a 747. Recovery of a payload from space using the N-wing parafoil was demonstrated in classified tests. The project was evidently canceled, along with USAF black spaceplane projects, by the mid-1970's when the military was forced to accept use of the space shuttle for their military missions. The configuration was released in 1983 with a terse statement that it was a contemporary DARPA study. Family: Combat spacecraft, US Rocketplanes. Country: USA. Launch Vehicles: Poseidon C3. Agency: NRL, USN.